I had lent my Slant-bar to Mr. Italo several months ago and recently he returned it, all shiny and cleaned up, ready to go. Today I used the Slant-bar with a fresh Treet Blue Special Blade and…ouch…a searingly close shave and lots of irritation as told by the alum block. This despite using a teriffic superlather with the Karite shave soap and cream. I could feel the blade dangerously close to the skin, but try as I might I couldn’t get a light enough touch. The moral of this story: Always go slow and careful with a razor you haven’t used in a long time. Finished with the extremely soothing Hydrolast Toner and Conditioner. Ahhhh! There are some great books that manage to distill and present information and insight in such a compelling way that they appear to be “new” knowledge, event though the ideas themselves have been circulating for a very long time. I have spent the last 35 years or so in the company of monks, mystics, and “masters” from a number of wisdom traditions – a result of my abiding curiosity and interest in what has come to be known in modern times as “Transpersonal Psychology”. Nevertheless, when I heard the audio version of Eckhard Tolle’s “The Power of Now” a few years ago, it was as if I were hearing these things for the first time – such was the effectiveness of Tolle’s communication style that for the first time, I really “got it”, despite the years in the company of other great “teachers”. BTW, if you’re going to read Tolle, I really recommend the full-version audio CD. There’s nothing like listening to it in his own voice, which I think is actually a strong part of his communication style. I’m just finishing Michael Pollan’s In Defense of Food, and am having a similar reaction to it. This is a truly amazing distillation of the current state of affairs of the Western diet and the well-orchestrated transition from eating food to eating nutrients instead. Suddenly every food package and every commercial that I see about food, provides overwhelming evidence for Pollan’s position. The worst packaged junk is now touted as being nutritionally beneficial because manufacturers have added Omega 3’s or Psyllium fiber, or probiotics, etc. Sugar-laden Nutella is “healthy” because it contains Omega-3’s. Processed white bread loaded with sugar and a chemistry set of preservatives is “good food to gow up on” because its made with whole grains. Pollan opens our eyes to what is going on around us in a very readable and actionable tome that is a must read in my opinion. A few years ago I read a magazine article by a 30-something journalist who had joined a hiking club and in preparation for a three-day outing into the mountains, he trained for several weeks at his gym with emphasis on the stair-climbing machine to build up his legs and aerobic capacity. I remember his line describing the eventual hike as follows: “Two hours into the hike, I knew I was in trouble when the 60-something lady behind me passed me on the trail, leaving me last in line and far behind the rest”. The point of his article was that the phenomenon of “exercise specificity” is always at play, i.e. you must train by doing the activity you are training for and not some poor surrogate such as the stair-climbing machine (unless of course, you happen to be in a stair-climbing machine competition!). Exercise physiologists, coaches, trainers, etc., have known about this principle for decades and there is vast research on it. Its nevertheless interesting that lay-people continue to diligently go to the gym (or not!) and “train” by lifting weights, riding stationary bikes, climbing onto elliptical trainers….when these activities have nothing to do with how they live in real life. Having been a member of many fitness clubs over the years (and actually attended with varying degrees of religiosity), I can attest that I never gained anything of sustainable value…except weight. That’s because there was no relationship between my “training” and what I did day-to-day. So, my quest these days is to focus on what I really need to keep beeing able to do for the rest of my life: Walk, bend down to pick things up, climb stairs, carry groceries, yardwork, ride a bike to the store, and kyak for pleasure on the lake across the street from my house. That’s about it! If I can keep doing those few things forever, I will be a very lucky person. And the way I plan to do those things is to, well….to do those things as often as possible, and at the same level I want to be able to do them at! The redesigned 2008 Subaru Impreza is advertised as “The Japanese car the Germans wish they’d made”. In “marketingspeak” what Subaru is trying to capitalize on is the perception that Japan-made Japanese cars are somehow superior to American-made Japanese cars. The linkage to Germany is of course intended to further reinforce this perception just in case you didn’t get it the first time. It must be tough for a company like Subaru to compete with other Japanese carmakers who, with great foresight, spread their risk years ago by setting up manufacturing in North America. Because at today’s low valuation of the US dollar it must be brutal to remain competitive and profitable selling cars made under the more expensive labor and currency costs of Japan. And it shows. Six months and 10K km in, I can say that the Subaru is the cheapest feeling car I have driven in many years. My wife’s 2008 Toyota Yaris bought at the same time is far better made, better finished, and better performing than the 8 thousand dollar more expensive Subaru. The Subaru feels chintzy. The interior choice of materials is piss-poor, with a black velour seating material that attracts dust and lint and always looks dirty. The first time I took it to an automatic carwash, water started to leak through the windshield, under the ceiling liner, and out through the dome light! Engine noise intrudes heavily into the passenger compartment because of very poor noise insulation. And when another car touched my bumper in the shopping center parking lot, the front passenger-side fender crumpled and a large paint ship broke off. And this with barely any sign that the front bumper had even been touched! The radio and heating/ventilation controls are minuscule, and the fake aluminum dash material looks like it was made by Mattel. About the only positive thing I can say is that the All-Wheel-Drive performs beautifully in inclement weather and the car drives like its on rails in any road conditions. There’s a big advantage to only making AWD cars…you certainly get lots of chances to get it right. Anyway, if the Germans are enviously eying the 2008 Subaru Impreza….they must really be in big trouble. Maybe that’s why Mercedes has almost the lowest medium-term owner satisfaction rating according to J.D. Power. #1 is Lexus (by Toyota), with Toyota and Honda right behind. And “Made in America” to boot. Its not how hard you go…. He told me about his new state-of-the-art carbon frame road bike with the latest technology….I told him about the Electra Amsterdam. Pretty neat how people with such diametrically different views can still be friends! I am addicted to the scent of Gold Dachs shaving soap. Man this is nice stuff. Lathers up real well too and not overly drying – a problem with some soaps such as Tabac. A second-use Treet Blue Special in the E.J. Chatsworth (a rarity for me but I had no time to change blades). The result: An excellent shave although I manged to nick a zit low down on my neck and it hurt like hell, but not much blood. 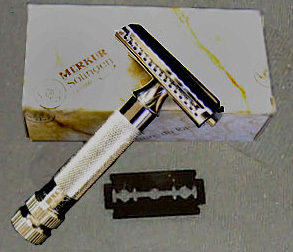 Still, the shave creams don’t provide the same level of blade cushioning and I think that I will start combing the G.D. with a cream for a superlather – pity though, for that incredible smell to be diluted! Finish with The Gentlemens Refinery Balm and Moisturizer, the former receiving an incredibly positive review on Badger & Blade just recently. A shot of Aqua Velva and Bob’s-Yer-Uncle! My business partner, Angelo, told me a story about his last visit to his grandmother in Crete a few years ago, just before her death in her late ’90’s. Early one morning, Angelo, a die-hard exercise enthusiast, decided to go for a run along the village streets. As he was putting on his running shoes and gear, his grandmother, already up at 5 AM and preparing food for the day, looked at him and asked, “Where are you going, Son?” Angelo replied that he was “going for a run”, to which she looked at him quizzically and repeated her question, “Yes, but where to?” This back and forth continued for some minutes as Angelo tried to explain that he was going running without a specific destination or purpose in mind, simply for “exercise”. Finally, it became obvious that she couldn’t grasp the concept of expending effort for its own sake, and he gave up, leaving her shaking her head and wondering if he had lost his marbles. While this story may seem quaint and cute it highlights a basic dilemma within our “fat cat” Western lives, in that we need to do specific physical exercise in order to compensate for the fact that we are basically inert most of the rest of the time. To us it seems perfectly logical, yet, to probably 4/5ths of the rest of the world, Angelo’s grandmother’s attitude would actually be more typical. Angelo’s grandmother got up every morning at 5 AM, prepared the meals for the day, cleaned house, and then proceeded to walk 5-6 km to join her husband in their fields and olive groves. There she worked for 6-8 hours (with perhaps a 1-hour nap right after the midday meal), before walking home the 5-6 km again. In 1975, after graduating from university, I went to Greece for 3 months. Within the first two I had dropped 50 lbs, while eating a very plentiful and unrestricted diet of Greek food drenched in olive oil most of time. The secret? Since I had nothing else to do, every day I walked the city streets for 6-8 hours, Nikon in hand, photographing anything that struck my fancy. The funny thing is: I had no awareness of having lost any weight as there were no scales around. In the mirror, I appeared to myself exactly as I had always been (that’s body-image for you). My only clue was when a friend from Canada visited me and couldn’t recognize me at the airport despite standing right in front of her. Anyway, all these thoughts in the wake of my experiment with the Electra Amsterdam and the ongoing effort to become more active without exercise. This morning I rode the Electra Amsterdam bicycle to the grocery store once again. The routine went much more efficiently than the first time, now that I knew where to lock it up and how to manage the logistics of groceries, saddlebags, helmet, etc. Piece of cake. When I got home it was just about time to leave for a client meeting about 10 minutes away in the Pointe-Claire Village. As I was about to don “the uniform” of suit and tie, I suddenly said to myself, “screw it, I’m riding the bike”…and in blue jeans to boot. Balsy! Well, I did it. Arriving to meet the client, I apologized for my attire and explained to him the commitment I had made to weaving more activity into my daily life as opposed to “exercise”. He was very impressed; turns out he’s an avid road biker with some pretty fancy high-end equipment. He lamented how he rarely gets to ride anymore because of family and time obligations, and he kept nodding his head and looking enviously at the Electra. Total ride today: 40 minutes, and about 400 calories…not bad and it didn’t feel like exercise, plus I saved some gas and got things done.